This is our Rhinoceros Muzzle. Like most of our pieces, this prosthetic appliance was made to fit most faces. The main picture above is the hot foam latex version applied and painted in greys. A huge rhinoceros muzzle! This piece has a wide and slanted snout, big nostrils, features 2 horns and has wrinkles all over with a wrinkled texture. There are built-in teeth in the mouth. Painted differently, it can be many types of rhinos, white, black, grey or anything else. It is in four pieces and comes unpainted by default. Contact lenses, ears and other prosthetic pieces other than the Rhinoceros Muzzle that are shown are not included. 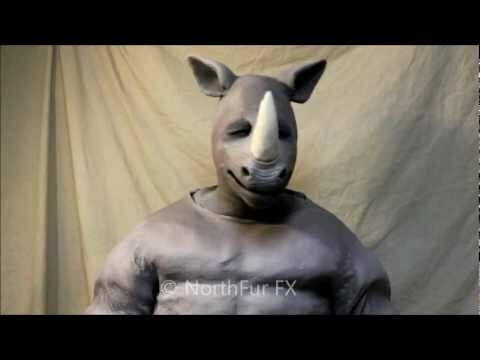 Using these types of costume accessories can help accentuate this prosthetic piece's rhino features.